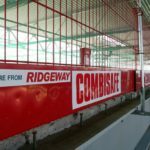 Ridgeway are a certified supplier of COMBISAFE products ranging from different types of barrier systems and stairs to temporary roofing and edge protection products. We stock a vast range of COMBISAFE products. COMBISAFE are world leaders in protection systems for working at height. Please click images below for more information. 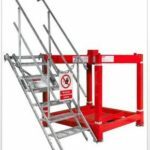 This loading system was designed to prevent falls from height during the loading and unloading of equipment from the top of a flatbed delivery lorry/trailer in a safe manner and it is available flat packed and with replaceable and adjustable feet. The COMBISAFE Loading System (CLS) Stair Bracket allows for a safe, easy access to the truck or trailer bed when using the Combisafe Loading System. It is simple to install with only one bolt needed to complete installation. 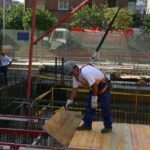 The POWER POST System is a safe and rapid edge protection for concrete floors, which can be fixed between concrete floors and soffits without anchors to provide safe and rapid installation of edge protection. 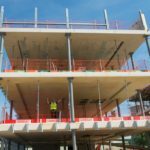 The COMBISAFE Steel Mesh Barrier System was developed to span trades, accommodating their different edge protection needs within the different phases of construction projects, combining a range of valuable benefits such as strength, durability, speed of installation and adjustability. A lightweight and CE-certified overhead anchor device designed to be installed, used and manoeuvred by one person, which helps to prevent falls from heights. A SkyReach Anchor is perfect if you’re working on a leading edge or installing decking for horizontal formwork. 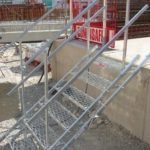 A quick and secure temporary access stair which is quick and easy to install on site and is ready to be used in minutes. 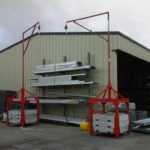 Available in 6 lengths, it is made from galvanised steel and offers a simple and effective access solution between floors in buildings under construction or different levels around a building site. The COMBISAFE Safety Net Fan provides collective protection from falling objects. 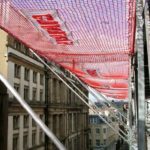 This Safety Net Fan is the latest innovation in high-rise protection and is suited to compact inner-city locations where space can be tight, and the protection of people and properties is essential. 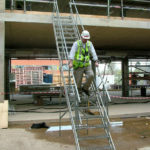 The Universal Stair gives complete access between building and scaffolding. It can also be folded flat for transport, easily assembled and automatically adjusts to a wide range of lift heights.